What's at stake on a face-off? Malholtra, Bergeron and Thornton, all players with face-off win percentages in the high 50s. What is the real value of winning all these face-offs? Does it change based on the zone? On the power-play? If other metrics consider the number of goals a player is worth per season, it seems like a player that wins face-offs should get some of that credit. But how much? In this post, we analyze the numerical advantage that winning a face-off gives an NHL team. Specifically, we look at differences in scoring rate after a face-off event depending on which zone the face-off is taken in (offensive, neutral or defensive) and whether the game situation is 5v5 or power-play / penalty-kill. The scoring rate after a face-off is determined by counting the number of goals that are scored for every 5 second interval after a face-off and dividing by the total face-offs. The goal scoring rate is expressed in goals per 60 minutes. The following two figures show the scoring rates after 5v5 face-offs in the neutral and offensive/defensive zones. There is little difference in scoring after a neutral face-off, whether it is won or lost. However, winning an offensive face-off provides a large boost in scoring rate. We calculate the 'swing' of winning a face-off as the expected increase in goalscoring rate plus the decrease in your opponents scoring rate. 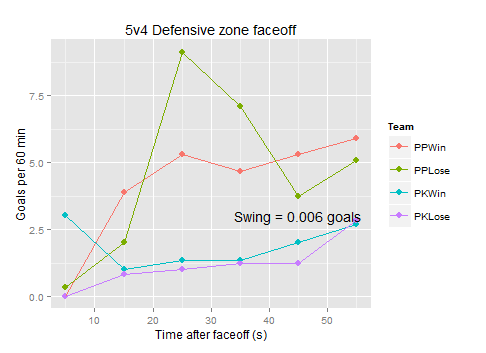 For a neutral zone face-off, the swing is 0.006 goals, while the swing for an offensive/defensive zone face-off is nearly 3 times that at 0.015 goals. That means that winning ~ 70 offensive/defensive face-offs is equivalent to scoring a goal. We now show similar plots for power-play (PP) / penalty-kill (PK) situations. The goal swing for winning an offensive face-off on the power-play (or equivalently, losing a defensive face-off on the penalty-kill) is 0.026 goals! This is by far the most crucial face-off in the game and teams are wise to match their best face-off taker for this scenario. Winning just 38 of these face-offs is equivalent to a goal. Another point of interest is the increase in power-play scoring after losing a defensive face-off (compared to winning it) around 20 to 40 seconds after the face-off. This indicates a trend that teams on the penalty-kill may lose some of their defensive structure after winning a face-off, which can increase their opponents' chances of scoring later on. We haven't seen this type of analysis on the NHL dataset anywhere before. However, we all know that each individual team has their own analytics experts working on these types of problems. Should a team invest more heavily in face-off specialists given these results? The answer will depend on what else the player has to offer. Certainly a goal-driven statistical analysis such as this would be a good start. Newer PostEvaluating the Elo algorithm - Can we predict wins?